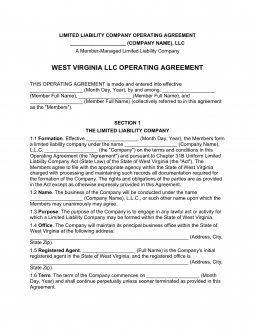 The West Virginia multi-member LLC operating agreement form, is a legal document that enables the members of an entity to claim ownership and management of their company, collectively. Although filing this document with the state is not prerequisite to conducting business in the state, the members must seriously consider the consequences of leaving this step unattended. The document provides protection to all contributing members in the event that any specific legal or creditor issues should arise by keeping all members private financials separate from those of the the business. The document will also record member contributions, valuations of interest, percentage of ownership and more. There are some tax advantages to implementing this document, as well. This document will create a shared government between the members in which all members will agree the stated policies and procedures. The members should review the information to ensure that all members are in complete understanding. If the members are unsure of how the document will affect the entity and the members, they may consider working with an attorney. Once completed the document will require the witness of a notary public, so that it may be effective. Step 6 – Additional Documents, Member’s Signatures and Notary Acknowledgement – Enter members signatures to the remaining documents. Must be signed before a notary. All members must receive a copy of the document for personal record keeping.